Yesterday Kevin and Rachel celebrated their 25th anniversary. It was a special opportunity to be with them and the grandchildren. I only wish Kate could have understood and been able to enjoy it. She got off to a rocky start. It was one of those few days that she didn’t know who I was when went in to wake her. I told her we were going to have lunch with Kevin. Knowing she can’t remember who he is, I was careful to tell her that he is our son. I don’t believe that fully registered with her. As she sat on the side of the bed before standing up, she gave me a puzzled look and said, “Who are you?” I told her, but she still looked confused. She asked me what she was supposed to “do now.” I told her it was time for a shower and walked her into bathroom. She showered and dressed more quickly than usual. I sent a text to Kevin letting him know she was up. His family was as well, and they came over for a short visit at the house before we all went to lunch. Kate was not in a good mood when she woke up and wasn’t interested in being with company. That and the fact that she had had trouble the day before led me to take the lead in our conversation. TCU is very important to her. I drew attention to the number of us who had graduated from TCU or were current students. Of the remaining two grandchildren, our granddaughter will be a freshman in the fall. I also mentioned that it was a special day, Kevin and Rachel’s 25th anniversary. My efforts fell flat. Kate was not ready to engage in conversation. I believe it was a combination of her mood as well as some insecurity. We had lunch together at a nearby deli. Kate was mostly quiet. I felt she was uncomfortable. After lunch, Kate and I came back to the house while Kevin’s family did some sightseeing. We were home about forty minutes before we left for Kate’s dental appointment. She frowned when I told her where we were going. I was surprised. She has always liked her dentist. She was quiet all the way. We waited a few minutes in the lobby before the hygienist came to take her to the back for her cleaning. Even though Kate has known her for years, she didn’t display any emotion of recognition or pleasure at seeing her. In a little while, the hygienist returned to speak to me. She said Kate resisted the X-Ray procedure. When she got to the polishing part, Kate seemed frightened. The hygienist didn’t go any further. I explained that she had not been in a good mood since getting up. Ironically, I had been considering taking her back for a cleaning every month or two. That doesn’t seem like a good thing. Besides that, she said Kate seemed to be doing a good job brushing. I told her I was a little surprised but that she brushes her teeth a lot during the day as well as when she gets up at night. She left and brought Kate back to the reception area where I took care of the bill. As we drove away from the dentist’s office, she said, “Are you hungry?” By this time it was less than three hours since we had eaten lunch, but it is not uncommon for her to think she is hungry even sooner than that after a meal. I understand from what I have learned from others that this is quite common for people with dementia (PWD). I told her I wasn’t hungry, but I thought it was a good time for a treat and mentioned going to Marble Slab. She liked the idea. After tasting the first bite, she raved about how good it was. I agreed. She continued to express her pleasure until she had finished. She was a changed person. All signs of moodiness had vanished in an instant. She talked about having another serving, and I felt the same way but didn’t give in. I knew that we would soon be having a big dinner. Coincidentally, I had read a relevant section of Dementia With Dignity by Judy Cornish earlier that morning. It is a companion piece to her Dementia Handbook in which she outlines the importance of focusing on the intuitive abilities of people with dementia (PWD). Her latest book gives more details on how to apply her theoretical framework presented in her earlier work. The part I read emphasizes the importance of managing the moods of those with dementia. She notes that PWD regularly fail at tasks and conversation and are unable to “understand where they are, why they are there, and who they are with.” She goes on to say that these experiences often lead to negative feelings. Her point is that caregivers can play a major role in redirecting their moods. I hadn’t been successful with that when we were with Kevin’s family earlier in the day, but taking her out for ice cream did the trick. That was good preparation for dinner. We came back to the house where she wanted to rest. Not long after that, Kevin sent a text asking if we were home. He and the children came over for an hour or so. We played Mille Bornes while Kate continued to rest. They left around 5:00 to get ready for our 6:00 dinner. The dinner went very well even though it was a challenge for Kate to keep up with the conversation. She had to ask us to repeat ourselves a number of times. After I offered a toast to Kevin and Rachel, she leaned over to me and whispered, “Whose anniversary is it?” Despite these things, I was encouraged she was trying to understand and didn’t appear to be withdrawn. So the day ended on a high note. I am glad about that but also disappointed that Kate was unable to fully enjoy what was a very special visit with Kevin’s family. The Christmas season has always been special for Kate and me. This year is no exception. Kate, of course, can’t have the same perspective. She doesn’t recognize it as a season, but that doesn’t take away from her pleasure. She enjoys each individual experience even if she can’t recognize and remember that it is the Christmas season. I know that we may not be able to enjoy the season in the same way next year, so I am savoring every moment and trying to make each one special. We attended our first Christmas event the last of November with a luncheon with the seniors at our church. Since returning from Texas, we have played a lot of Christmas music and watched quite a number of Christmas concerts on YouTube. In addition, a good bit of the music I play at home is music of the season. Last Thursday at opera night at Casa Bella, one part of the program featured Christmas music. We were back at Casa Bella on Monday night for their annual Christmas dinner that also included a program of music. We will attend jazz night tonight. I am sure we will hear more of the same music in a different style. Everything we have experienced until last night has involved traditional music. We joined friends at the Flat Rock Playhouse in North Carolina for a Christmas program featuring Asleep at the Wheel. Quite honestly, I had never heard of the group until a couple of months ago when a couple we met at Broadway night told us about them. Knowing that Kate is from Texas, they thought it would be something they would enjoy. I was hesitant but accepted their invitation thinking that Kate might like it and that it would be a good social occasion for both of us. I am glad I did. For those of you who, like me, haven’t known about this band before, I should let you know that they are an Austin, Texas, band that has been around since 1970. Ironically, they started in West Virginia. They have won 10 Grammy awards over that time and have had quite a number of big hits and albums. Like all the other groups of that age, they have only one of the original members with them, their lead singer. The other members are all on the young side. That adds a good bit of vitality and quality to their performance, but it is still a classic Texas-style band. Even when they play traditional Christmas music, it has a Texas flavor. Given that description, you might expect that it is not my kind of music, and I would say that it isn’t the kind of music that I would play at home. On the other hand, Kate and I loved it. We found the group to be very likeable personally and the rhythm of the music engaging. I found myself tapping my feet throughout the performance. Every time I looked at Kate, she was smiling. It was a good night to let your hair down and enjoy the season. This will go down as a unique Christmas event for us and an interesting complement to the other seasonal events we are enjoying. It was also another reminder of the power of music to stir one’s emotions. The night before we had watched a memorial service with Itzhak Perlman and the Pittsburgh Symphony. They were honoring the memory of those killed at the Tree of Life Synagogue. It was a moving performance. The emotions aroused by that concert were quite a contrast with those we experienced last night. No wonder music has such impact. It has the ability to stir so many different feelings. It has touched our lives in many ways, and I expect it to do so in the future. Kate and I moved into our present house 21 years ago this past July. Not long after that, I chatted with some neighbors while I was out walking. They asked if anyone had told me about Halloween. I told them I hadn’t, so they proceeded to inform me. I don’t recall any specific numbers, but I was surprised to learn that we get a lot of trick-or-treaters. We got very few at our previous houses, and the last one was only a quarter of a mile from the new house. Since that time, we have discovered just how big a deal Halloween can be. During our first year or two we had around 200, but each year it has grown. Last night, we set a new record with almost 850 children who stopped by the house before we ran out of candy at 8:15. You might think that’s a lot, but it’s far from a record on our street. Our neighbor across from us said they had around 1200. They had more candy and continued until after 9:00. We may not have the highest total number of trick-or-treaters, but we’re the only ones serving water. Yes, that’s right. I said “water.” This is something about which Kate has taken great satisfaction over the years. As we were making plans the first year, she said, “I’ll make sure to have plenty of water.” I said, “Water? I can’t believe kids would like that. They’re after anything with sugar in it.” She insisted. We had water, and to my surprise, it was well-received. As the number of visitors increased, I decided to buy a 5-gallon cooler for the water. Even with that, we have to refill it once or twice. After running out of candy last year, we had up to 20 people at a time waiting in line for water. That would have happened last night if we hadn’t run out of cups, 350 of them. We refilled the cooler twice. We dispensed about 11-12 gallons of water, so I am acknowledging to all that Kate was right. There really is a market for water – even on Halloween night. You don’t suppose that it was Kate who provided that knowledge to all those companies that bottle and sell it everywhere we go? As you might expect, all this requires a little planning and coordination. Our first year in the house, I realized we were going to run out of candy very early and quickly went back to Target for more. We still didn’t have enough. We also learned that it made no sense to stay in the house and wait for the doorbell to ring. We found it much easier and efficient to sit outside. Kate tends to the water and I give out the candy. Of course, there are times when I have to go back inside to replenish our supply. Sometimes Kate would be alone for a few minutes when a large number would arrive at the same time. Although it’s been almost eight years since Kate’s diagnosis, last year was the first time I felt that she had any trouble with her role as the “Water Lady.” I suspected then that this year would be different, and it was. For several months, I had planned to get someone to help me and just let Kate enjoy the children. About six weeks ago, I discovered that a couple that has been helping us with some landscaping goes all out for Halloween. The husband told me he and his wife had heard about the large turnout we have on our street and wondered if his wife and daughter could come to the house to see first hand what it is like. I told him that would be great and that I could put them to work. That worked perfectly. The daughter took charge of giving out the candy, and her mother assisted with the water. Kate started out the evening by filling the cups with water. She was very slow. Ultimately, I started filling the cups. I was also in charge of replenishing both water and candy as needed. Kate got cold and wanted to go inside. That left my two helpers and me to take care of things which wasn’t a problem. It’s just that I was hoping Kate would derive more pleasure from being with us. I felt this was her last time to be a part of things. I doubt seriously that she is likely to participate at all next year. Perhaps, the saddest part for me is that she never seemed to recognize that she was behind our having water in the first place. She used to have fun reminding me that it was her idea, and that I was wrong about its popularity. Last night she expressed very little enthusiasm for the entire affair. She did enjoy seeing the children for a while but tired of that much earlier than I would have expected. So it was a successful night for trick-or-treating but also sad to think that this long-standing tradition will not be the same again. Kate and I have celebrated our anniversary in Asheville many times. It comes around Memorial Day, and there are always interesting things happening while we are here. When we were here last year, I wasn’t sure that Kate would be back this year. As with so many things, she has surprised me, so I made plans just a couple of weeks ago. I’m glad we made it one more time. If you’re a regular reader of this blog, you know that Kate and I have a daily routine when we are at home in Knoxville. Apart from our morning visit to Panera for Kate’s blueberry muffin, we know the restaurants where will be eating for lunch and dinner each day of the week. That routine has created an interesting and very supportive network of people. We find that we are drawn to the various restaurants more for the social reasons than for the food itself. That leads me to tell you about a special relationship we have developed with a server here in Asheville. We met her at lunch several years ago, when she was working at one of our favorite places. On a later trip, we went to lunch at a different restaurant. It turned out she had moved to that restaurant, and she remembered us. Since that time, we have made it a point to eat There each time we visit the city and, of course, ask for Melissa. The last time we were here was in December. I mentioned that we might see her again at the end of May, but I was doubtful. She asked for our home address and sent us a Christmas card with a very nice note attached. I was touched by that and intended to write her a note telling how much her note had meant, but I lost the address. I decided I should call the restaurant to get it but never got around to it. Then as our anniversary date got closer, I thought about making the trip back to Asheville to see her as well as Jenny who works at the front desk at the Haywood Park Hotel where we always stay. Two weeks ago, I called the restaurant and learned that Melissa had changed to another restaurant in town. It’s another place we have eaten a number of times over the years. I called and left a message for Melissa to text me. She did, and we arranged for this year’s visit. Our lunch turned out to be the highlight of the day, not because of the food (which was excellent) but because of Melissa. I should add that we have established relationships with servers in a number of restaurants in Knoxville. That is not surprising given that we see them so frequently, most of them once a week. This bonding with Melissa is unique in that we are here only two or three times a year at the most, and I don’t know that we will ever be back. What I do know is that it is possible for people to connect in a special way even in something as fleeting as a “server/guest” relationship. Melissa and other servers who have been so kind to us may never know how much they add to our lives. Postscript: We discovered that she and her husband’s anniversary was also yesterday. It’s just two years for her, but I hope our 55 years together will be an inspiration for her. We returned home just before 7:00 p.m. tonight after spending three nights in Fort Worth. As I have suggested in other posts while we were gone, I am very glad we made the trip. Kate enjoyed seeing her extended family. She didn’t, and still doesn’t, remember most of the names, but she has a strong emotional tie to her family. In recent years, as her short-term memory has faded away, much of her conversation with others has drifted toward family. Most of that has been about her mother but has included her father and her extended family. I didn’t imagine her having another opportunity to share special moments with them. While it is unfortunate that this one was prompted by her cousin Chester’s death, it is in times of loss that family ties seem especially important. In this respect, the weekend could not have been better. Travel is, however, demanding for Kate, and I must admit something of a challenge for me as well. I envision that it is a combination of these things that will ultimately cause us to curtail it. For Kate, there is a certain amount of pressure or stress in being in strange places and with large numbers of people she doesn’t remember. She made it through Saturday beautifully. At the visitation on Saturday evening, one of her extended family members and I noticed her in conversation with another member of the family. She appeared to be an equal participant in the conversation. I suspect she didn’t know who she was talking with, but I am sure he conveyed either directly or indirectly that he is part of the family. She obviously was quite comfortable with him. This is also true for her with most people, especially if their interaction is brief. Nonetheless, it requires a lot of effort to “perform” in this way. She has been very tired the past two days. She went to bed around 8:30 Saturday night. I had to wake her up at 10:00 Sunday morning so that we could meet several family members for a lunch to celebrate Kate’s 77th birthday. She didn’t want to get up, but she did. Slowly, but she got up, and we arrived in ample time for her celebration. I had originally planned to stay in Fort Worth last night. Knowing that it is sometimes difficult for her to get going in the morning, I changed my mind and made reservations in a hotel near the airport in Dallas. That way there would be less rushing to make our flight at 12:15. That turned out to be a wise decision. She was asleep by 8:00 last night, and she slept until 9:00 when I woke her up this morning. Although she would have preferred to stay in bed, she was very cooperative in getting up, and we were able to leave for the airport at 10:00. That gave us time to get something to eat before our flight. Everything else went smoothly on the way home. We arrived a few minutes early in Atlanta, and our flight from Atlanta to Knoxville was right on time. We stopped by Chalupas to get a bite to eat before coming home. It was almost 7:00 p.m. when we got to the house. I went back to our bedroom around 7:15. Kate was already in bed. She was wearing a robe that was inside-out as happens a good bit. Using hand signals, she asked me to get her a night gown. I brought one to her. She stood up to take off the robe and put the gown on. I started to unpack some things and noticed that she was putting on the robe again, the right way, and had not put on her gown. I mentioned it, and she put the gown on. That kind of confusion is common, but I believe travel adds an extra measure of confusion because of the unfamiliar surroundings, especially when we are moving from one unfamiliar place to another as people do when they travel. She often asks where we are when we travel. That was different this time. I only recall two times that she asked, “Where are we?” One of those was at dinner at the hotel in Dallas last night. The other was when we got off the plane in Knoxville and were walking to baggage claim. As many times as we have walked through that airport, she didn’t recognize it. It is impossible for me to understand how stressful travel is for her because she never talks about it. I don’t know how much of this relates to her general preference not to dwell on her Alzheimer’s or if she really doesn’t sense the stress. I believe it is the latter. 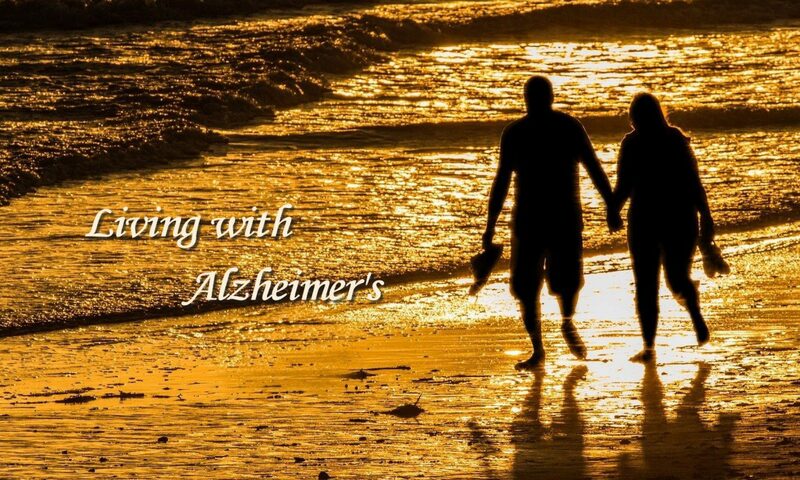 I think she forgets she has Alzheimer’s except when it comes up at one of her doctor’s appointments. That makes me think that at the very least she doesn’t connect her diagnosis with her experiences. For me, the most challenging aspect of travel involves airports. That includes going through security. I find myself focusing on getting all the things that need to go through the scanner unloaded and then putting those things back on or in my clothes on the other side. Kate is often confused by the instructions given by the personnel; so I have to watch for that. It is hard enough for me to remember to take everything of mine that has been scanned. Now I have to make sure I have her things as well. I wish the security check were the most difficult part of travel for me. It is not. It is changing planes in Atlanta that is the challenge. I fear losing her as I did the other day. I can’t tell you how stressful that was. There are so many people and places that it is very hard to find someone. Another concern is use of the restroom. It takes her a long time in the bathrooms at home, but in an airport there is a substantial challenge. I have already identified family restrooms in the Atlanta airport and may soon try those. One additional issue with travel is getting from one place to another in a timely fashion. She has only one speed, and it is very slow. At home, I can control much of this because I try to avoid as many specific time commitments as I can. That works pretty well. When we are traveling, you have flight schedules that are not flexible. In addition, when other people are involved, it often involves a set time to meet. This always means planning in advance to make sure we are on time or reasonably close. When you add up all these things, and I am not beginning to remember the many little things that come up when traveling, I can see why some people stop traveling long before we have. Even with that, I am not ready to call it quits. I still want to make at least one more trip to Texas. If that one is half as successful as the one we just took, I might think about another. My head tells me that it is unlikely that we will do any more airline travel after the next six months, but my head has been wrong before. I hope it will be once again. Yesterday was Kate’s birthday, and I hadn’t envisioned much of a celebration since we were in Fort Worth for the memorial service and related events surrounding the passing of her cousin, Chester. It turned out, however, that we didn’t have anything scheduled until the family gathered together at 1:30 before the service at 2:00. Kate’s cousin Sharon asked if she could take Kate to lunch as a birthday treat. Together we turned that into a larger gathering to include Kate’s brother, Ken, and his wife, Virginia, as well as our son Kevin’s family. It was a special treat to have another cousin of Kate’s who is from Massachusetts. She hasn’t attended as many family gatherings over the years, and it was nice to visit with her. We met in the Franklin Center of the Methodist church where Kate’s family had been members for so long. Her grandparents’ home had stood on a portion of the property now occupied by the church. The Center has a display of some of the things from the home. Kate loved looking at these things as if for the first time. In her mind it was exactly that. It was a beautiful service and especially moving for Kate. Family has always been important to her, and Chester was significant for a number of reasons. He had remained in Fort Worth as the rest of the family had made their way to other places. Family was very important to him. We saw him as someone who kept the family memories alive in the place where Kate’s grandparents had made their mark in the early part of the twentieth century. Chester had also been very active in the community in a variety of ways. The church was packed to honor him. Following the service we spent a little time with Ken and Virginia. Then they went back to their home in San Angelo. We checked into a hotel near the airport for our flight out shortly after noon today. Kate is sleeping soundly. I will probably wake her in another hour or so. I would like to leave for the airport around 10:00. As we leave today, I am feeling good that Kate has had this time with the larger family. That is not something I had thought would happen. She won’t remember it, but each moment meant a lot to her. Our first day back in Fort Worth was a day filled with reunions with family, some we hadn’t seen in many years and a few we had never met. We were brought together to celebrate the life of Kate’s cousin, Chester Hendricks. We attended a private graveside service with family on a cold morning that was offset by the warmth of this family reunion. As someone who came from a very small family, my mother, father, and brother and a few others whom we rarely saw, I’ve always been struck by the emotional ties that bind the Franklin family together. Today’s gathering brought back memories of the early days when I was introduced to the family. By now, of course, those who were the senior generation are no longer with us, and the rest of us have spread to other places. When we first heard the news of Chester’s passing, I knew this was a time for Kate to be with family. Chester was four years older than Kate, but they had grown up together and shared many family times. Despite the challenges of travel with Kate, yesterday’s experience confirmed that coming back was the right thing to do. At the graveside service, about half of the family were seated under the canopy while others gathered around the edges. Kate and her cousin, Sharon Billings, took a seat. I started to join them but did not because I didn’t want to disturb the two oldest members of the family who were seated in two chairs I would have had to go through. As the minister made his remarks, I noticed that Kate was wiping tears from her eyes. Sharon reached in her purse for a tissue and then put her arm around Kate. There have only been a few occasions when I have seen Kate cry. She was obviously very moved. I felt a need to be beside her and made my way to her side. I can never know exactly what she is thinking or feeling. I do know that she can’t remember most of the family who were in attendance or even that we are in Fort Worth. On the other hand, she understands she is with family, and, in that moment, she remembered Chester. While that emotion lasted only for the duration of the service, it was clear that she was saddened. Her tears brought back moments at Christmas when we were in Lubbock with Kevin’s family. She seemed to be experiencing a sense of melancholy as she reflected on the past. Chester was buried in the family plot. After the service, Kate and I walked around to see the headstones of some of the other family members who are buried there. We lingered over those of her mother and father and an infant daughter who died two years before Kate was born. She didn’t remember the infant daughter’s death. Over the past few years she had talked about that daughter’s passing and that it was something she had not realized as a child. I pointed out the two spaces where our ashes are to be buried. The family gathered for lunch at one of Chester’s favorite barbeque places. Then we returned to the hotel until 3:45 when we met Kevin and his family at a nearby Panera. We came back to the hotel to meet Ken and Virginia and one of Kate’s cousins, Ethel Longfort. From there we attended Chester’s visitation. There was a much larger crowd than the family we had been with earlier in the day. There were literally hundreds there to pay their respects to Chester who had been very active in business, church, and civic affairs in Fort Worth for all of his adult life. It had been a very good day. I am so glad Kate was able to be here.